Description Prior to DF 0.40.24 building a construction on a tree would cause the tree to vanish. In the current version it now causes a game crash. has duplicate 0008810 resolved lethosor Crashes half a minute in. has duplicate 0008872 resolved Footkerchief Crash after traders leave map? has duplicate 0008740 resolved Footkerchief Fort Mode crashes in early Autumn of the first year. has duplicate 0008948 resolved lethosor Consistent crash within minute of load, unknown reason. has duplicate 0008981 resolved Knight Otu Crash when floor is built in square that has branches. has duplicate 0009687 resolved Knight Otu Crash on building floor. can we up the severity on this? it's happening really frequently for me, remembering to ensure spots I'm trying to construct on don't have leaves, twigs etc growing on them is not easy. also the description needs to be changed on this, it's not just underground trees. There is also a crash if you attempt to build over tree parts above ground. I attempted to build some stone floor on a tile currently occupied by twigs, and it crashes the game. Testing proves that it is the act of building on the tile itself, and not due to eager dwarves crossing tree branches to build on that tile early which would force the tree to support the construction. se5a: The "severity" field is not used to prioritize issues at all - I only changed it to reflect the fact that this bug causes a crash. Manae: Going by the title of this report, that is the same issue (although the description doesn't accurately reflect this). I just did some quick look into the game binary and have (probably) found the cause of the bug and a way to fix it. 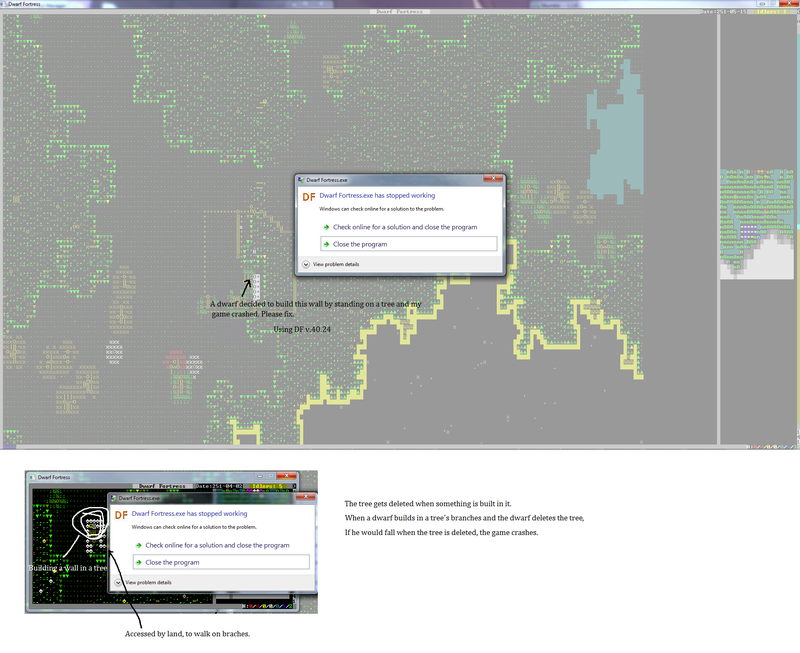 In Windows DF SDL 40.24, at dwarf fortress.exe+8F7174, inside a loop which seems to be intended to extirpate the tree, a function which is likely to be destroying all buildings built on the tree also deletes pending construction designations (which is a "building", in terms of game data structure). This also deletes the construction being finished and results in a hanging reference to it, and when the game later calls a virtual function of the structure, the vtable pointer has already been overwritten, causing a failed function call, which causes a segmentation fault. (Yeah, the good old delete object at a wrong time -> hanging reference thing). A fix for this would be that just ignore any construction designation on the tree when destroying buildings on the tree. A better fix for this would be not destroying the whole tree, but rather changing the construction designation into construction, and then remove the tile from the tree's structural data. This way you don't even need to destruct any buildings on the tree since the only tile changed is the tile of the construction, plus a possible down slope if the tile was an up slope, a down slope if the construction is an up slope, a floor if the construction is a wall, and down slopes don't support any sort of buildings, and a new down slope or floor will not cause a building to collapse. A binary fix for Windows SDL 0.40.24 is available. Just change Dwarf Fortress.exe+8F7165 from 74 12 (je +12) to EB 12 (jmp +12). This reduces this bug from a crash to some weird behaviour (cut tree vanishes, leaving buildings on it floating in air. But weird behaviour is better than a crash isn't it?). Of course, these are all done in a hurry and I do not guarantee they are 100% correct, nor do I guarantee the safety of the fix and am not responsible of any harm that might be done to your beloved dorfs using this method. I have a game that crashed repeatedly, cause unknown but it was while floor-building in tree foliage was designated, so most likely it was this issue causing the crash, when the dwarfs eventually got around to building those floors. However, on the most recent attempt, they succeeded in building the floor, with strange results. This was a fungiwood tree growing in a lake on the first cavern level. The second cavern level was very close to the first at that point, so on successive Z-levels top to bottom, we had: 1. foliage with floors designated for construction; 2. lake (7/7 water) and the fungiwood trunk; 3. open space of the second cavern layer. When the dwarves built the floor, the entire tree vanished, leaving a cell of open space on the lake level where its trunk had been. No floor. That created an opening to the second cavern layer, and a dwarf fell through the hole, landing on a mushroom cap a couple Z-levels further down. However, the 7/7 water surrounding the open space did *not* flow into the space. I have a cell of dry open space connecting to the next layer, surrounded by 7/7 water.